Jack O'Lanterns made from food cans. Wash out the cans and remove the labels, making sure there are no sharp edges. Find some jack o’lantern patterns online or create your own and draw the design on the can with a marker. Instead of carving, drill holes along the lines of the pattern or hammer the holes in with a nail. Wipe off any additional marker or it may streak when you apply the spray paint. Spray paint the cans with orange spray paint. I didn’t use a primer, but I totally should have. After about half a dozen coats it still didn’t come out quite as orange as I would have liked. Finally paint over the design with some black paint so the lantern looks great in the daytime too. Pop in a battery-powered candle and voila! Eternal Jack O’Lanterns. I may add some green wire to hang them and look like stems too. I got the original idea for these on Pinterest via Saved By Love Creations and I think I may try lanterns for other seasons one day. They are super cheap and cheerful! What an interesting, fun idea. You can save these ones for next year, collect more large cans, and then create some more! 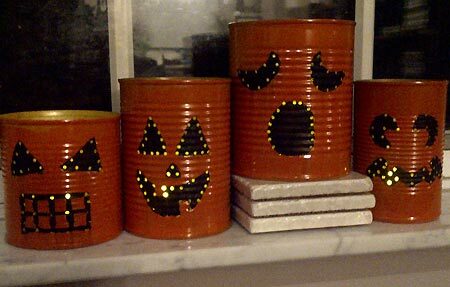 I think you found the perfect way to reuse food cans and have a fun piece of art for Halloween. Congratulations for coming up with this activity. I loved the faces and colours that you used.